I recently got a 7inch by Mütiilation that was sent to Mortiis and signed for him by Meyna'ch and it gave me the idea of this thread. Do you guys own some personnal stuff that were custom made or signed for other people back then? Some of these things are cool though they may touch a fetishist side of collecting which I find ridiculous (like "this was Michael Jackson towel in a concert from 1987"). Wasn't that one on Discogs (and the seller not being Mortiis)? Stuff I don't care about: test pressings, patches, signed items, letters. I have a few of each but only 'by accident'. And my own old letters disappeared in a move. 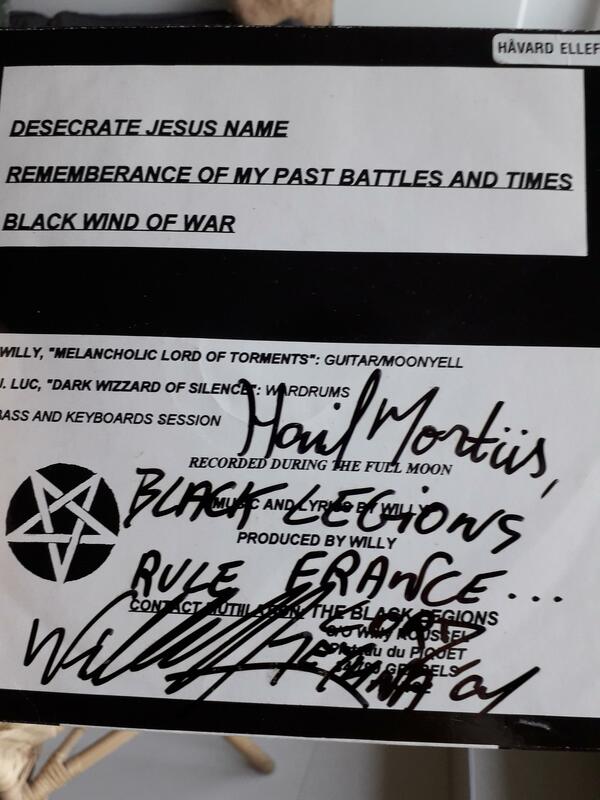 Had a few from Mork (Malign/Watain) that were more like calligraphy than writing etc, those were nice to look at. Stuff I don't care about: test pressings, patches, signed items, letters. I have a few of each but only 'by accident'. And my own old letters disappeared in a move.